As a fan of geolocation technology in all of its interesting and frightening forms, I was glad to stumble across San Francisco photographer Eric Fischer‘s visualizations on Flickr. In “Locals and Tourists,” Fischer created maps of the geotags embedded in photos, and then separated photos taken by locals from those taken by tourists (and from those he couldn’t easily categorize). He did this for over 100 locations around the world, and the image above is his map of Honolulu. Even though the underlying map and the island boundaries are nearly invisible, you can see the general shape of Oahu’s southern coast. Photos by tourists are shown in red, photos by locals are shown in blue, and photos that could be by either are shown in yellow. On the Honolulu map, Waikiki Beach is a nearly solid red line. Off to the northwest, another splash of red over what looks like the Arizona Memorial and the shuttle boat route across Pearl Harbor. Between them, a cluster of blue and red over downtown Honolulu. In the mountains above Waikiki, a smattering of blue dots over Tantalus and Round Top Drive… indeed a favorite vantage point for locals that tourists don’t visit quite as often. Fischer has undertaken other interesting visualization projects as well. The image below, posted earlier this month, is a simple map of race distribution in Honolulu, based on the 2000 U.S. Census. You can also see how prevalent the Asian population is, and how the white population understandably clusters around military facilities. Fischer created maps for nearly 100 locations after seeing Bill Ranklin’s “Radical Cartography” race map of Chicago. 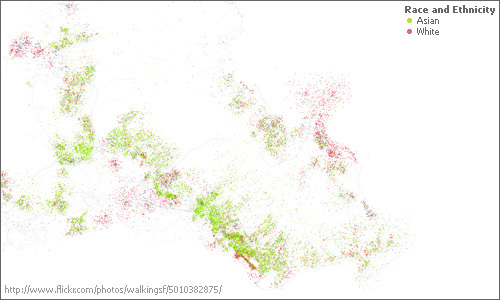 The boundaries between ethnic communities there were much more stark. Click through either image to see the full-size maps. LOL, wow, that’s crazy. I can’t even fathom how to undertake something of this magnitude. 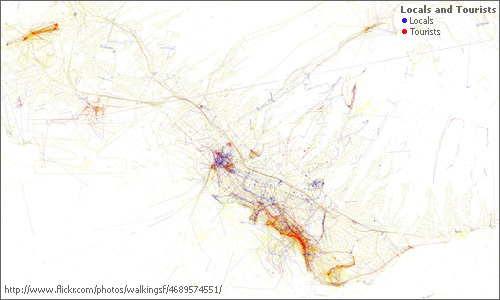 Geotagging for 100 cities? It certainly seems that locals and tourists are definitely not spending their time (or at least their picture-taking time) in the same areas. And to further break it down by race? Sweet.